Although trekking across the Camino de Santiago (Way of Saint James) is mostly an enjoyable experience, there are a few hazards associated with making the 500 to 560-mile (800 to 900-kilometer) journey in little over a month. The Camino de Santiago is spread out across most of Spain and France and travel along one of its paths has been a tradition for Christians around the world since the Middle Ages. Similar to the pilgrimages to Rome and Jerusalem, traveling to the shrine of the apostle Saint James the Great in the cathedral of Santiago de Compostela in Galicia was (and still is) considered by many in the Roman Catholic faith to be a way to earn an indulgence—a reduction of the punishment for earthly sins in the afterlife. However, throughout history, pilgrims have experienced various degrees of hardship and discomfort along the way—perhaps as part of earning their indulgence. Depending on when you walk the Camino de Santiago, there are a number of annoyances, setbacks, and even injuries you might expect on your trip. In order to adequately prepare for your pilgrimage, you should keep these hazards (and some great solutions to them) in mind when planning and packing for the journey. Additionally, you should practice good self-care while walking the Camino de Santiago, which could include treating yourself to a ​nice hotel when you finish in Santiago. Blisters are the most common ailment suffered by pilgrims on the Camino de Santiago, especially since so much walking is involved in the trip. However, blisters are pretty easy to avoid if you wear proper footwear and ensure the insoles of your shoes haven't worn away. A type of band-aid popular with pilgrims is called "compeed," which you can buy at any farmacia (pharmacy) on the route. Alternatively, you can buy the American alternative, Spenco 2nd Skin Blister Pads, before you depart for your journey. If you get blisters and you start to walk differently, you may get tendonitis as a result, and even if you haven't got blisters, tendonitis is a common problem for pilgrims. Most people are able to overcome this injury with a little rest (either stopping completely or walking shorter days). If you don't speak Spanish, ask a Spanish speaker to help you at the pharmacy to find a medication that will help alleviate the pain associated with tendonitis. When it comes to preparing for a hiking excursion, many people often overlook the importance of selecting the right hiking backpack for their trip. Carrying too much or having an ill-fitting bag might cause back pain, which can become a serious issue when hiking. Bad posture can also contribute to back pain. The size of the bag you'll need depends on how far you're traveling along Camino de Santiago and what you absolutely must have for your trip. A medium-sized pack with enough room for a week's worth of clothing and other travel necessities will keep the weight down. You should also make sure your bag has all the right straps and is tightened in all the right places and that you are walking properly to avoid injuring your back. Speaking of high-quality backpacks, equipment breaking or being ineffective are common problems pilgrims might face along the route. A bag or pair of shoes that seem fine when you try them on in the shop may not be right after you've worn them for 300 miles. Ineffective equipment can cause a variety of injuries and discomforts along the way, so make sure you buy durable gear or be financially prepared to stop along the way to purchase new equipment if yours gives out. Spain is a hot country and even though the north is more temperamental than Andalusia, high temperatures are common and a lot of the Camino is very exposed to direct sunlight. As a result, many travelers along the route who are ill-prepared for the climate get a sunburn or, worse yet, a heatstroke. Normal precautions apply: get yourself a small bottle of (at least) factor 30 sunblock. A good all-weather clothing option is a light buttoned shirt since the long sleeves will keep the sun off or can be rolled back when there is cloud cover and can serve as a warm article of clothing on crisp mornings. Many fear getting lost on the Camino de Santiago, but you shouldn't have much difficulty finding your way as routes are clearly marked. Still, it is possible to wander off the path, especially if you make a detour off the beaten path. If you do find yourself lost, just three Spanish words will get you back on track: "¿Para el Camino?" This phrase literally translates to "for the Road," but it is used to ask "how do I get to the Camino?" Every local will know where you need to go and will point you in the right direction. Most pilgrims bring a guidebook that has maps of the route, which can be useful for planning your route each night (as there are many routes to choose from along the way. Alternatively, some travelers just get a compact and lightweight Camino map book instead of carrying around a hefty guidebook. Make no mistake about it, the Camino de Santiago is a long journey, and although most pilgrims won't suffer exhaustion or dehydration along the way, it can become an issue if you don't get plenty of rest and remember to drink plenty of water. Walk at your own pace, eat appropriately, drink regularly, take the steep sections slowly, and don't over exert yourself. Give yourself enough time—between a month or two—to do the entire Camino so you can take shorter days where necessary. A list of the towns and villages coming up—with details of their facilities and the distance between them—is essential. This will help you decide if you need to stop in one town or wait till the next. Carrying a heavy pack for long distances on rough terrain can be hard on the knees for anyone, but especially for people over the age of 40. Joint stiffness and soreness can be amplified by exhaustion and dehydration, so be sure to stretch before you start out for the day and stay hydrated while you walk. Though everyone dreads the uphill climbs before they take part in the Camino, it is actually walking downhill that is most likely to cause injuries, especially to the knees. If you have a history of knee pain, be sure to take the downhill routes at a comfortable pace to avoid injury. By the side of the road on the way into Estella is a memorial to a Canadian lady who tragically lost her life after she was hit by a drunk driver. Of the 100,000 people who walk the Camino each year, she is one of the very few deaths reported along the highway in the last 50 years. There have been a few violent attacks along the path, too, but these are few and far between as well. The number one thing to remember when traveling the Camino—or anywhere unfamiliar to you—is to always be aware of your surroundings. As an added precaution, if you're starting out before sunrise, consider taking reflective gear, especially on weekend mornings when drunk drivers are most likely to be on the road. Only you know if you can do the Camino. 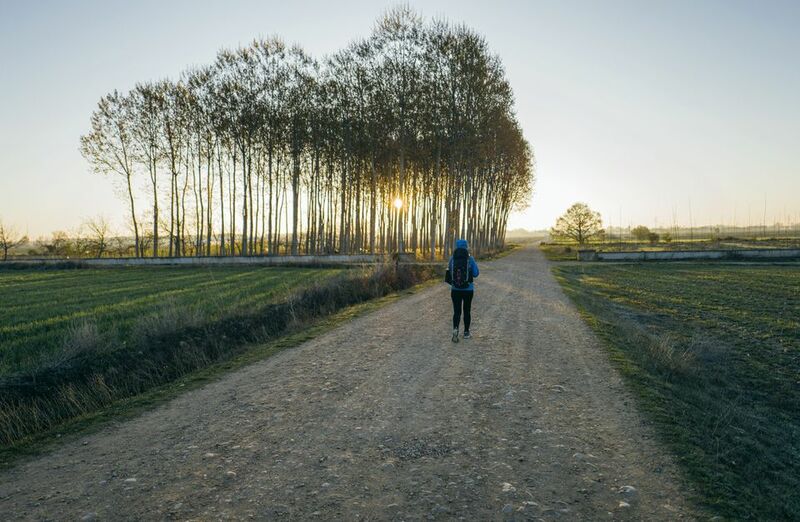 While the Camino a relatively easy (if not long) journey for someone in good health, the fact that people do die of heart attacks and other medical conditions means you should be sure you're physically prepared for the trek. If you have (or suspect you have) asthma, a heart condition, arthritis, or other pre-existing ailments that you think may impede your progress on the Camino, consult your doctor before you travel. While on the Camino itself, take a mobile phone and remember that 112 is the emergency services number in Spain.